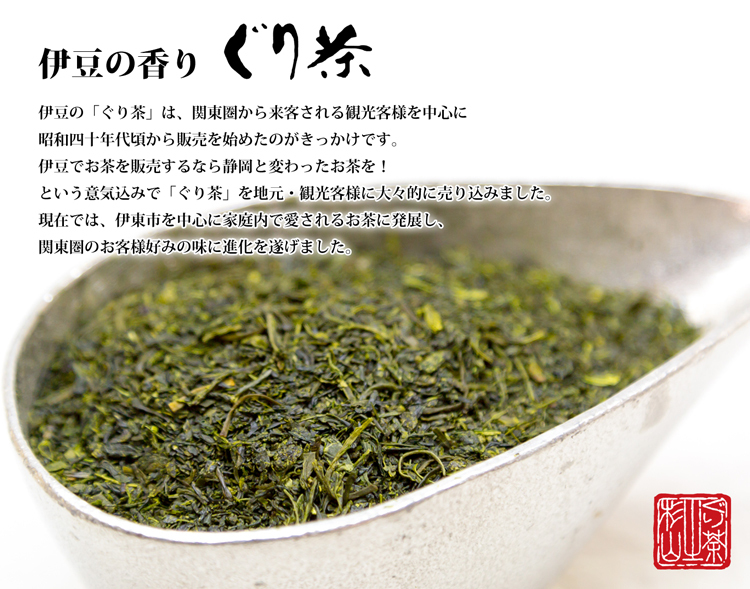 "Guricha of Sugiyama" is produced by steaming green tea leaves deeply into the core and slowly for a long time. It is distinguish from the conventional type of "sencha (refined green tea)" by its elimination of the final kneading and leaf-reshaping process during the production of "aracha (unrefined tea)." It prevents fresh leaves from degradation, and thus extracts a greater amount of green tea components coming out from leaves. This unique production method can contain rich-bitter taste of the taste and preserve the essential flavor of green tea. "Guricha or Guri-tea" is named from its shape similar to "guri" which represents the pattern of elaborately-coated red lacquer ware, or the whirlpool-like arabesque design. The official name of the product is steamed rounded green tea. Copyrights (c) 2012 ぐり茶の杉山 All Rights Reserved.